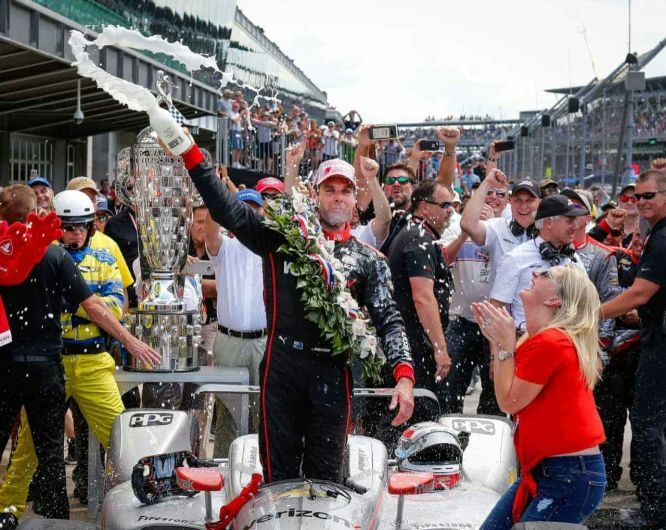 Team Penske veteran driver Will Power just won the biggest race of his career at the Indianapolis 500. Will Power celebrates, while his wife Liz cheers him on, after winning the Indianapolis 500, for the first time. It was Power’s 11th attempt to win ‘The Greatest Spectacle in Racing’. It was team owner Roger Penske’s 17th win and the 10th win for Team Chevy. The weather for the 102nd Indy 500 was a stifling 91 degrees, the second hottest in history. Team Chevy finished 1-2 in the race. Power’s #12 Verizon Team Penske IndyCar Chevrolet V6 led 59 laps during the race and finished 3.1589 seconds ahead of pole-sitter Ed Carpenter. “He won the race today because he was the best. It’s a great day for Team Penske and a great day for Chevrolet,” Roger Penske said. This is Power’s tenth year driving for Penske on the Indy circuit. Power and his wife, Liz, live in Charlotte, North Carolina with their young son Beau. Ed Carpenter finished career-best second in his hometown race. Carpenter in No. 20 Fuzzy’s Vodka Chevrolet led 65 laps. While this is Power’s first win at the Indy 500, he already won on the 2.4 mile Indy road course. He is the first driver to win on both courses. He is also the first Australian to win the Indy 500. The 2018 Indy 500 was Danica Patrick’s last race. She competed in the Daytona 500 in February and said this race would be her last. Her day ended in disappointment when she crashed about a third of the way through the race. Helio Castroneves’ attempt for a record-tying fourth Indianapolis 500 victory ended on Lap 147 in a single-car accident and Tony Kanaan crashed with just ten laps to go in the race. Races like Indianapolis 500 are important not just for publicity for the companies that are involved, but also for research. Many of the strategies used in racing like light-weighting will eventually be used in regular vehicle production, if the solutions are practical. The race cars help the auto companies study fuel conservation and engine performance. The Team Chevy vehicles are powered by 2.2-liter twin-turbocharged, direct injected V-6 engines.